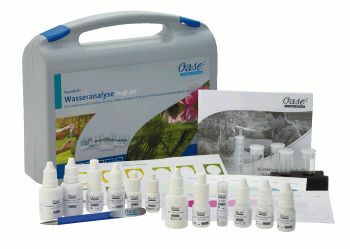 The OASE Profi Test Set is a professional water testing kit for accurately measuring and monitoring the most crucial pond and lake water quality parameters. The test set includes a detailed instructional document for guidance and is supplied in a professional plastic carry case with handle. Drop solution tests for precise determination of 9 key water parameters. Tests for pH, Hardness GH/CH, Ammonia/Ammonium, Nitrite, Nitrate & Chlorine. 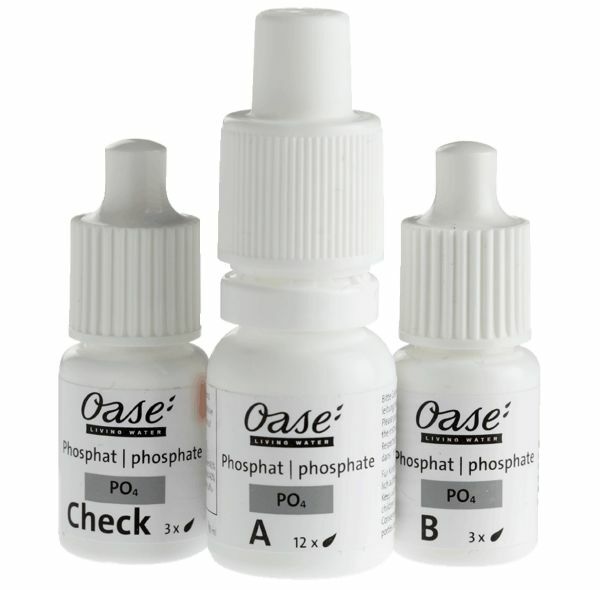 Phosphate test including shelf-life solution test also included in kit. Includes applicator, spoon, measuring beakers and pen. Colour charts supplied for accurate results analysis. Set allows for multiple tests to be carried out for each water parameter. Refill packs available for replacing used tests. Water Analysis Profi Test Set - Test Parameters and Their Significance. 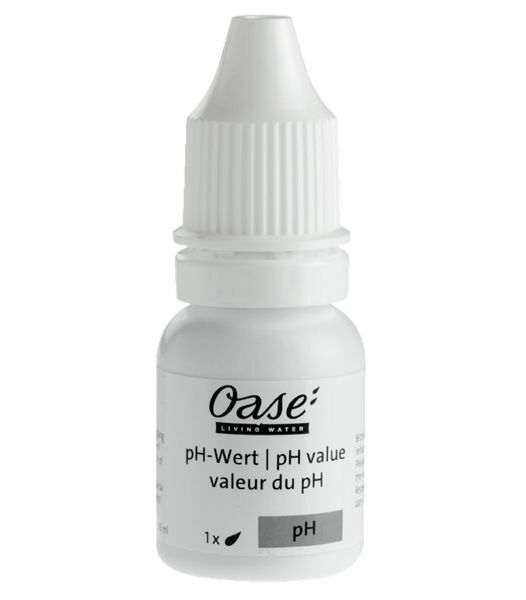 The pH level of the pond indicates the acidity or alkalinity of the water and is largely dictated by the carbonate hardness. A near neutral pH level ranging from 6.8 to 8.0 is acceptable in most fish ponds. Too much of a rise or fall in pH can lead to issues with water quality and fish health. pH can be buffered and stabilised by introducing Pond Salt to the water. pH can be raised by dosing the pond with AquaActiv OptiPond, or lowered using AquaActiv pH Minus. The total hardness of pond water is dictated by the levels of elements such as calcium and magnesium in the water. Water rich in these elements is known as ‘hard water’ and water lacking in these, ‘soft water’. 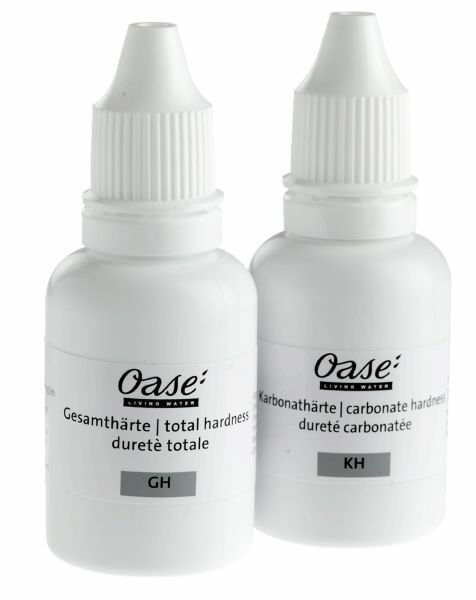 A good total hardness of 10ºand 15º dh ensures that the pond remains chemically stable and more resistant to change. 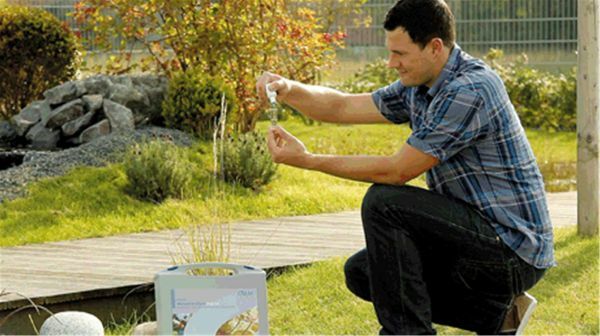 Hardness can be improved by introducing AquaActiv OptiPond. Carbonate hardness is critical for chemical stability in pond water and subsequently, the health of fish and, in particular, aquatic plants which absorb carbon dioxide. The carbonate hardness is dictated by the level of hydrogen carbonate ions present in the water. Ideally carbonate hardness of pond water should be at 5-6º and should not drop below 5º. Carbonate hardness can be raised with AquaActiv OptiPond. 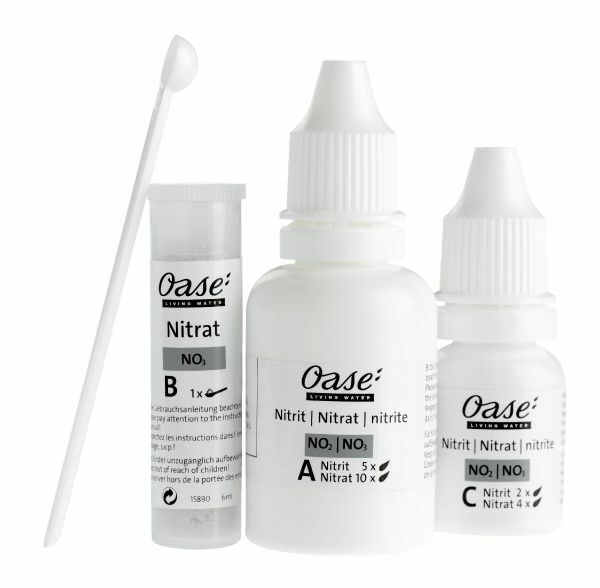 Nitrite is a by-product of ‘nitrification’, a regularly occurring natural process in all pond water. An effective nitrogen cycle converts nitrite into less harmful nitrate via bacteria named ‘nitrobacter’ present within filter media. Too high a level of nitrite can lead to serious pond/fish health implications and a level no higher than 0.05mg/l should be present. High Nitrite can be prevented by installing a correctly specified Pond Filter and reduced with a small water change the introduction of BioKick Fresh water treatment to boost the bacteria levels in the pond. Nitrate is the result of an efficient nitrogen cycle in the pond and can also occur through decomposition of fish food, waste and plant matter. Nitrate can be tolerated by aquatic life in far higher concentrations than Nitrite, but excessive Nitrate can cause algae issues. Ideally Nitrate would be less than 20mg/l in a fish pond, but this can be tolerated up to 60mg/l. 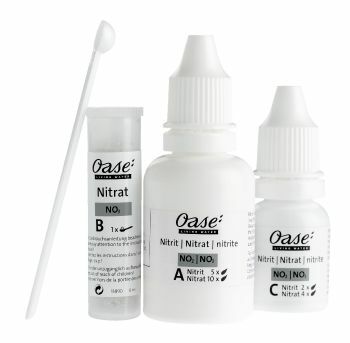 A nitrate level of 100mg/l or more would require addressing. Nitrate can be effectively reduced by regular, small water changes and by using biological Viresco Algae Control treatment to actively absorb Nitrate. Phosphates are nutrients present in pond water, which occur through natural processes of decay and decomposition in organic matter. Phosphates can also be present in tap water and run off water from surrounding areas, particularly if fertiliser is used. Phosphates are absorbed by plants and are therefore required in natural ponds, but high levels can also lead to algae issues as algae will thrive on excess Phosphates in the water. Phosphate reading should be no higher than 1mg/l. 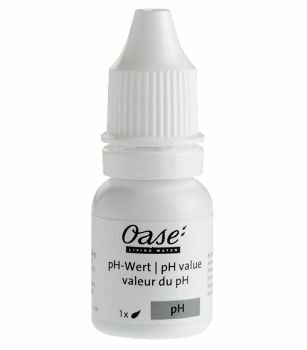 PhosLess media can be used to reduce Phosphate levels. Ammonium ions are present in water as a result of fish waste, fish feed and other sources of unused proteins. Ammonium is at its highest concentration in water with a pH of below 7. In a healthy ecosystem Ammonium is oxidised quickly and efficiently, but insufficient filtration or an overload of organic waste can lead to intolerable levels above 0.5mg/l. High Ammonium can be prevented by running a suitable Pond Filter and supplementing the pond with biological water treatments such BioKick Fresh. Ammonia occurs as a result of life present within the pond via the digestion and excretion of solid and soluble waste. Ammonia is very poisonous and can cause serious health issues and even mortalities if present in the water. 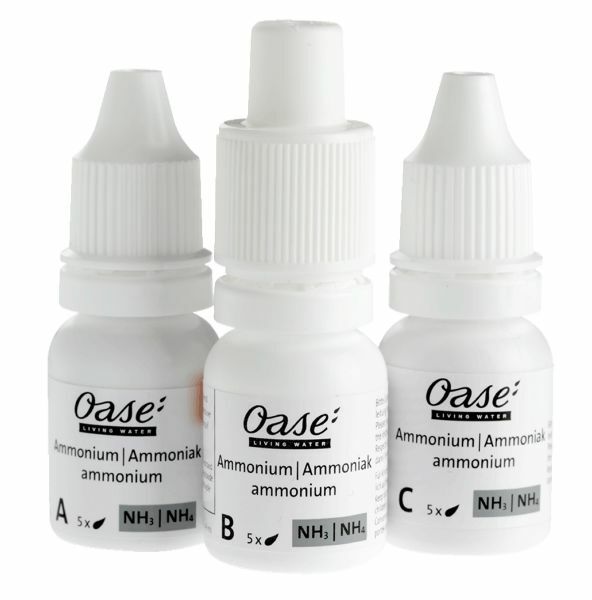 Ammonia content should never exceed 0.5mg/l. A well specified Pond Filter should ensure Ammonia is effectively converted. Rising Ammonia can be caused by an insufficient pH and can be neutralised through the introduction of AquaActiv OptiPond and better Ammonia conversion can be achieved through dosing with BioKick Fresh. Chlorine is often present in tap water and can be poisonous to fish when levels are too high. Ideally there should be no Chorine present in a wildlife/fish pond. Chlorine can be effectively purged from water by introducing AquaMed Safe & Care to the pond or prevented by using a Tap Water Dechlorinator System which automatically removes Chlorine before tap water enters the pond.